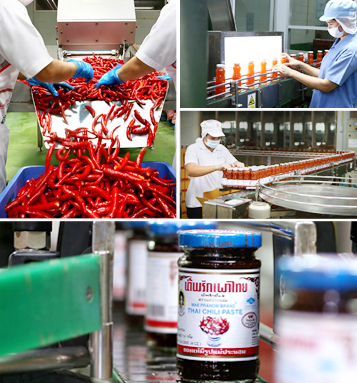 Phiboonchai Maepranom Thai Chili Paste Co., Ltd. operates a recognized and approved hygiene and safety food production process, which begins with the strict inspection and acceptance of all raw materials, all the way through the production process, to the final packaging process. All raw materials have to be fresh, new and clean.​ They are also routinely tested for chemical traces. Selected raw materials are then sterilized, before proceeding to the production process according to the original Thai recipe. All types of packaging must also first be cleaned and sterilized before entering the computer-controlled automated packaging machine, imported from Germany. The quality control system, active throughout the entire production and packaging process, consists of a team of highly qualified, experienced and well-trained personnel. 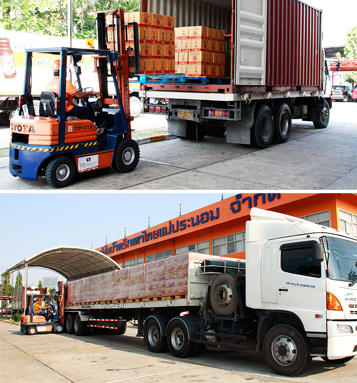 The Phiboonchai Maepranom research and development team is also completely dedicated to developing its production technology and range of products. Phiboonchai Maepranom has a laboratory for physical, chemical and micro-biological test to ensure safety and quality. A team of specialists is in charge of all aspects of quality control to ensure that all “Maepranom” products meet recognized quality and flavour requirements. ​The most significant corporate policy is that all “Maepranom” products are entirely free from artificial additives, monosodium glutamate and preservatives. Thai herbs rich with nutritional qualities are often mixed in the food products. Every ingredient used in the production process is a product of nature.